Fácil combo de bicicleta, caminata y vela. Navega por la costa para disfrutar de las impresionantes vistas de Diamond Head. Diversa flora y fauna, incluyendo delfines, tortugas y vida marina tropical. 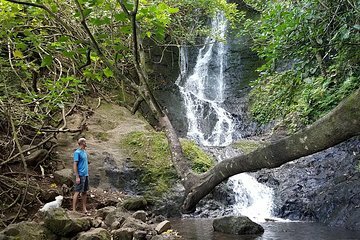 Este aventurero combo de Oahu comienza cuando te atas las botas y te embarcas en tu excursión de ida y vuelta a través de la frondosa selva tropical de Oahu. El sendero se encuentra en 75 acres (30 hectáreas) de tierra antigua y sagrada, y ofrece a los visitantes una visión de la isla que de otra manera nunca habrían experimentado. En total, el moderado toma 1.5 horas y está dirigido por guías locales, quienes le contarán la historia cultural de la zona mientras se aseguran su seguridad en el camino. A continuación, cambia los zapatos por un poco de esnórquel y aletas cuando salgas al agua, donde navegarás por casualidad por la costa de Diamond Head en un velero de 38 pies (11,5 metros). Esté atento a los delfines o tortugas spinner mientras navega por el arrecife y, finalmente, deténgase para ir a nadar y hacer snorkeling con el equipo proporcionado a bordo. Finalmente, para acercar el día al emocionante día, tome un casco y prepárese para un paseo a través de la selva tropical de Pu’u Ohia. En este camino pavimentado, de 8 km (8 millas), cuesta abajo, tendrá la oportunidad de escuchar a los pájaros de los bosques nativos cantar y revolotear a través de las copas de los árboles, mientras disfruta de vistas panorámicas y de lecciones sobre geología y cultura. Al final del día, después de caminar a través de la selva tropical, andar en bicicleta cuesta abajo y practicar snorkel en el arrecife, el transporte incluido lo llevará de regreso a su hotel de Waikiki. Tenga en cuenta: El orden de las actividades está sujeto a cambios, en función de la temporada. Terii was such a fun and insightful tour guide! Funny, fun and so easy to be around. Even the sandwiches were tasty and that they provided water and snacks made it that much sweeter! Thanks again! We had a great time. Totally worth doing the whole combination. This was probably the best tour we took on our holiday in Hawaii. Rodolph was an amazing guide and so informative. The kids had a ball, and the day was packed full of adventure for them. The hike was awesome, although I recommend insect repellent as they breed the mozzies big! I was travelling with my husband and three kids 13,10,8 and this was a great adventure for them. I was worried initially about the bike ride component as my 8 year old thinks he is Evil Knievel, but it was so well managed and I felt completely safe at all times. The snorkel was a lot of fund. We saw dolphins and turtles and the kids had a ball just jumping off the boat into the ocean. I would thoroughly recommend this tour. We had an amazing day and got to see some special places. Thank you Rodolph for such a wonderful adventure! This was an AWESOME tour! The hike in the rainforest was so beautiful, the biking all downhill with amazing views and the snorkeling we were surrounded by fish and spotted a turtle. Our hiking guide, Michael, was incredible. Our whole family really enjoyed this tour - one of the best we have ever taken! Thoroughly enjoyed the Bike, Hike, Sail and Snorkel Combo - even in the drizzle through the bike and hike! The guides were knowledgeable, approachable and great fun. Snorkelling over the Turtle Carwash was a real treat too. This is a great activity if you have the time to do it. We had a great time doing all the activities especially the cycling and the sailing, however my husband particularly liked the snorkelling as he saw the turtles which was a real treat. This was the BEST tour. Our tour guide Jeremy was FANTASTIC. So helpful, so knowledgable. Hike through the forest was just lovely. The bike ride easy. And the sailing and snorkeling the best. Would recommend this tour to anyone.